A New General Superintendent: Cause For Celebration, Or Concern? After many rounds of voting, the Church of the Nazarene has elected the first of two general Superintendents that are needed to replace two retiring Generals. His name is David Busic. Dr. David Busic, at the time of his election, was the president of Nazarene Theological Seminary, and professor of Preaching and Pastoral Theology. He has an impressive resume, and seems like a nice guy. But let us consider some issues that may be of great concern to many Christians. Concern #1: Emergent Connection or Lack Of Discernment? At his inaugural address, Dr. Busic made many references and quotes of Phylis Tickle, a major leader in the emergent church movement, of which she has coined the phrase “the great emergence.” Tickle promotes contemplative spirituality. Phylis Tickle likens heretic Brian McLaren to Martin Luther who helped bring about the Reformation. She is probably correct, but this new current reformation is not a good thing. Tickle receives high praise from emergent heretic Doug Pagitt, calling her “the best friend the emergent movement could ever have.” Tickle is currently a Senior Fellow of Cathedral College of the Washington National Cathedral, which has a heavily interfaith message. The Cathedral College also is known for its heavy promotion of all forms of contemplative prayer: centering prayer, silence, stillness. Tickle is also on the editorial board of explorefaith.org, and the recommended spiritual experts on the site are a veritable who’s who of “Christian” mystics and non-Christian gurus such as Guru Ram Dass, Buddhist Master Thich Nhat Hahn, the Sufi Muslim Rumi. Imagine that Luther’s Sola Scriptura, so critical within the Reformation movement, of which many left the persecution of the Catholic Church, some under pain of death, is no longer relevant according to Phylis Tickle. What does this say of her regard for God’s word? In fact, Phylis Tickle does not believe that the entire Bible is God’s word. Conclusion: Why would a learned man such as David Busic want anything to do with Phylis Tickle, even if just to quote her and speak highly of her in his messages? If a well respected man quotes someone favorably and praises them, would not most Bible believing Christians think that this person is a good source for them to go to? I would like to find out what Dr. David Busic really thinks of Phylis Tickle, in the light of all the heretical things that she stands for. Is it really wise that a church has just elected a General Superintendent who at the very least, seems to have some really impaired judgment and discernment? Interfaith Connection? Or Simply Carelessness? I was concerned about something I ran into the other day, and wondering if you were aware of it. At the CRES website, the Seminary is listed favorably as a recommended institution friendly to the CRES organization. My concern is that it is an interfaith group that works closely with practically any kind of religion in the world. On their vision statement page, they say this: “CRES values the contribution of each distinctive faith in healing the crises of our age — and finds it important to honor and preserve their distinctions. 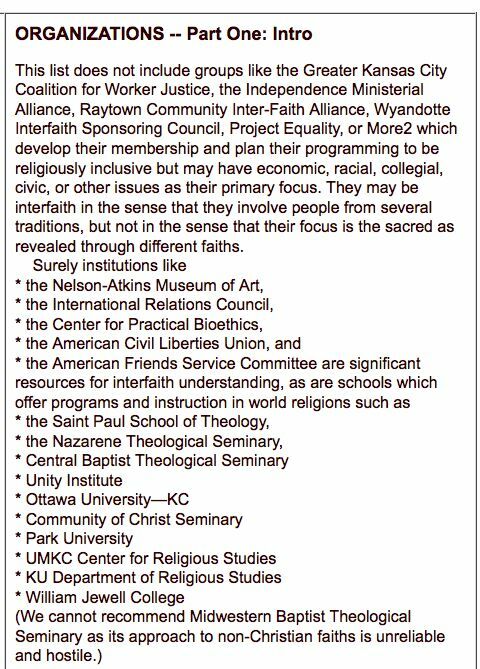 “These faiths include: Buddhists, Muslims, Native American religions, Hindu, Sufi, Unitarian Universalists, Taoism, Confucianism, Wiccans, and Zoroastrians! I did not receive any response from Dr. Busic. It is clear to me, a non-seminary educated man whose father always wanted him to be a pastor, that this scripture passage alone answers the question. We are not be joining ourselves with those who are pagan and do not preach the Gospel of Christ. And if these pagans are recommending us favorably, as if we also are favorable to them, it would do us good to have no connection at all with them, and no hint of any kind that we are aligned with their ungodly agenda. There is only one right thing to do, and the president of NTS has not done it yet. I call on him to do the right thing, remove the connection with this ungodly group, and make it clear that we do not stand with them in any way, no matter what “good” causes they may be involved in. Conclusion: Is this a matter of discernment? Is this a matter of lack of knowledge? Dr. Busic never answered me. Perhaps others can bring this egregious connection to his attention, and he will do the right thing. If not, then we have a serious concern on our hands, with a man who has just been chosen to the highest office of a denomination of over 2 million people. To be favorably and knowingly linked to such a group, which cannot even be called a Christian organization, is a clear indication of lack of discernment, or an indication of solidarity with their ideas. Either way, it not good for the Church of the Nazarene. We have elected David Busic. The question is, was that the right decision?